Beneficial insects are great for any garden, and there is none more lovely than the butterfly. If you want to know how you can optimize your garden to attract beautiful butterflies and caterpillars then this is the podcast for you! Dr. Nancy Greig, Ph.D. is our guest. 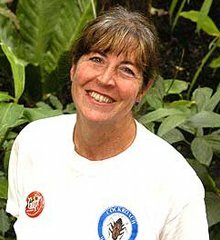 Dr. Greig is the Director of the Cockrell Butterfly Center in Houston, TX. If you are enjoying our podcast, please consider jumping over to iTunes and giving us a rating. Also, don’t forget to submit your questions!